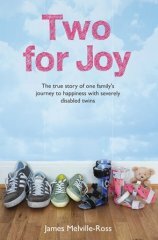 Author – and father – James Melville-Ross presents the reader with the inspiring story the path himself and his wife, Georgie, have followed as parents to two severely disabled children, and their battle to fight stereotypes and stigmas against disabilities. Since the twins’ diagnosis, James has become a disability bore. He’s given speeches at Downing Street and at Parliament, written blogs and articles. The more he told the twins’ story, the more he realised what a powerful tool their tale is for righting misconceptions and ignorance about disability. An amazing book, which will make you laugh and cry and leave you in awe of this incredible family. Cannot recommend it highly enough. An inspiring work of art. Totally moving book that has changed how I view disability. Its honest, funny, sad, uplifting - and mind opening. Thought provoking, insightful, heartwarming and made me cry. Amazingly honest story. A moving reflection on parenting children with disabilities. Frank and honest. Amazingly written. One feels a little closer to how it must have been for this young couple. The emotion and exhilaration all mixed into one. Definitely my first choice to win! An incredibly moving story that is told with honesty as well as humour. A must read for all parents. Great book made me laugh and cry, but laugh more. An incredibly powerful, candid and heartwarming story. I couldn't put it down. I would highly recommend voting for this book! Wonderfully told, emotional story about how even very bleak moments as a parent can bring happiness and joy. A very positive, inspirational book. Well crafted, honest and thought provoking book. Read it in three sittings.